Would you be interested to know what those ‘tweaks’ are? There’s a BIG difference when it comes to writing for men…and women. Most B and C copywriters soak their copy with words and phrasing that completely turn women off. If you use these words in your copy…you could lose HALF your potential market. And leave a tonne of money on the table. Well, today you’re in luck. Because Pete and me are going to help you get your copy on track. We’ll help make sure your copy is packed full of emotionally-charged copy that hits the right emotional triggers for the women in your market and pushes them towards a sale. On the show today we’ve got a very special guest. World-class female copywriter (and former Baywatch super-star) Lorrie Morgan-Ferrero. Over the next 26 minutes you’ll hear as Lorrie shares her hard-won tips on how you write compelling sales copy that gets the ladies in your market buying. And a whole bunch more…press the play button above and listen in now. 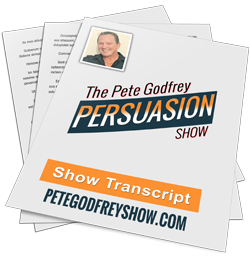 Subscribe, rate and review ‘The Pete Godfrey Persuasion Show’ on iTunes.